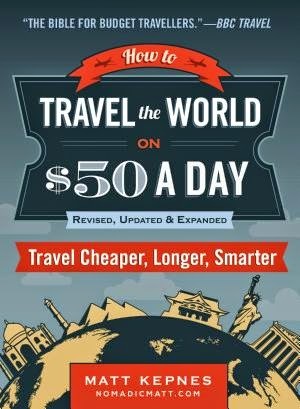 A few weeks back Justin and I went to a book talk in Atlanta to hear Matt Kepnes speak about all things travel and his book How To Travel the World On $50 A Day. I had been following his blog for over a year and this was a fantastic opportunity to hear him speak about the one thing I know very little about – travel. He opened his talk by reminding everyone that $50 a day was an estimate and not a specific value. Obviously a trip to Paris will cost a lot more than a trip to Vietnam. Food is more pricey, hotels cost more, and by far you will not have anywhere near the same experience in both places. Nevertheless, he went on to say that traditional forms of travel – staying in expensive hotels, eating at fancy restaurants, and even paying fees for expensive museums – are not necessarily the only way to travel. He talked about staying in hostels, using AirBnb (and other services like it), suggested researching your location prior to visiting to see when museums offer free days… And really, he just went on and on about ways to not only save money while in other countries, but also the best ways to make money for indefinite stays. Before we left that night, Justin bought a copy of How To Travel. While I wasn't entirely sure the book would be helpful (Matt Kepnes and I have different views on travel), it's always a good idea to support the people you enjoy hearing – authors, musicians, and artists alike. I started looking through How To Travel at dinner that night (a very late but delicious dinner at Sweet Auburn BBQ. YUM! ).The book is broken up into two sections – very generic travel advice in section one and advice more specific to the region you are traveling to in section two. Obviously I read all of section one and only glanced at the advice pertinent to me in section two. • Learn how to make your money work for you and never pay overseas bank fees again. He does talk about this in his book. He lists one bank, Charles Schwab, that this works for. He also lists a few others that will reduce your banking costs. Will you never pay a bank fee again though? It depends. Will Charles Schwab always remain free? Will you lose your debit card while traveling forcing you to use another bank? I would take this statement with a grain of salt. • Learn how to use travel credit cards to gain hundred of thousands of free frequent flier and hotel points. How good is your credit? Don't buy into this thought process if your credit isn't good or you struggle to pay back your debts. There are definitely ways to get points for free without signing up for a credit card, but saying you can get hundreds of thousands of points is definitely a stretch of the imagination. • Master the ways to get FREE airline tickets and save thousands – yes, free! Once again, how good is your credit? Assuming you aren't relying on credit, you can spend thousands of dollars to obtain a Southwest companion pass (or $300 if you are in Atlanta and can take advantage of their most current promotion of flying 3 times before summer). Needless to say, don't buy this book if you are trying to get a freebie without getting some credit cards. • Learn the ins and outs of round the world tickets (and whether or not you need one). True. He does cover this. • Discover what to look for in a backpack so you get one that lasts forever (and is always comfy). Ummm… His instructions are pretty generic. Go to a store, find one you like, buy it. • Find out where to find travel discount cards that can save you 40% or more on your trip. Truth. He covers this. Just keep in mind this is about attractions, museums, and the like. It may save you money, but it might not. Saving money with some passes just comes down to how many museums you can visit in one day. Other passes require pre-planning where you buy the pass in the US and then travel since the pass is cheaper here. All of this info can be found online though, so a book isn't necessarily necessary unless you are trying to support the writer. • Learn where to send your mail and what to do with your stuff before you set off on your adventure. 1. Have your family and/or neighbors get your mail daily. 2. Contact USPS to have them hold your mail until you return. 3. Sell everything you own OR put it in storage OR have your family check on your home/apartment while you are away. • Get demystified about what travel insurance is, why you need it, and how to pick the right coverage. This is definitely something he covers well. He explains what you need regarding health coverage as compared to product insurance and he recommends a few places to get it. I'm not sure if it's really necessary or not, but you really don't want to be in another country needing it and not having it. • Get the secrets to eating cheaply in any city in the world. Let me share that secret: go grocery shopping. Cook your own meals. Eat picnics. I guess he also recommends having lunch out rather than dinner because it's cheaper. Either way, none of these are truly secrets. You just have to put a little thought into it. 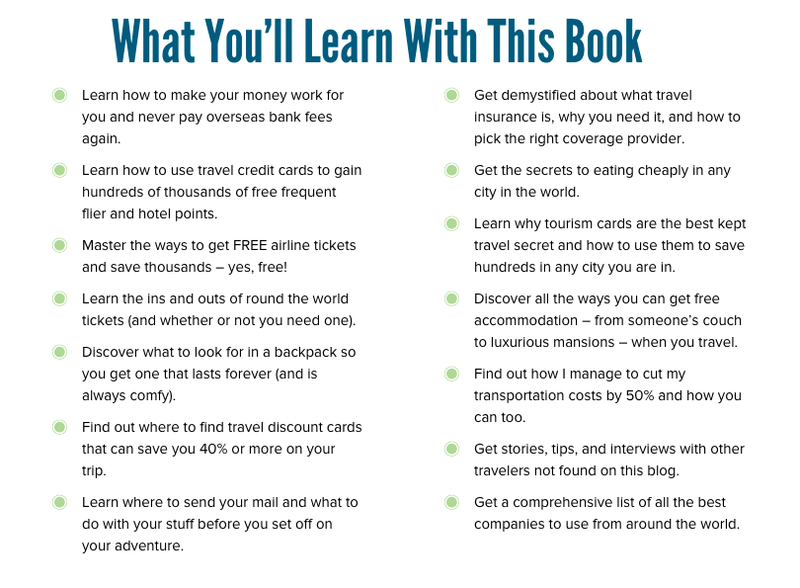 • Learn why tourism cards are the best kept travel secret and how to use them to save hundreds in any city you are in. • Discover all of the ways you can get free accommodation – from someone's couch to luxurious mansions – when you travel. You know the saying "nothing is for free"? Same here. You may be required to do some work and the likelihood of you staying in a mansion for free? Next to none. The author says he's done it, but I wouldn't place all my hopes and dreams on it. • Find out how I manage to cut my transportation costs by 50% and how you can too. Easy. Walk. Use public transportation. Taxis (and in some instances) cars are for the rich. • Get stories, tips, and interviews with other travelers not found on my blog. I'm not an obsessed fangirl and I don't really care about whether or not something is or isn't on a blog. Kudos to you for writing a book, but I despise being "sold" to. • Get a comprehensive list of all of the best companies to use from around the world. Very generic, but true. He recommends insurance companies, places to book a room, places to work while traveling, where to find tourist discounts, and so much more! Is this a book worth getting? Everything he talks about can be found online since he does have a blog. In fact, what you find online will ALWAYS be more up to date than what can be found in a book. With that being said, if you plan on travelling soonish and you want the list of websites he recommends available to you for quick and easy access, it may be a book worth purchasing, especially if you have very little experience with travelling or researching for travel. 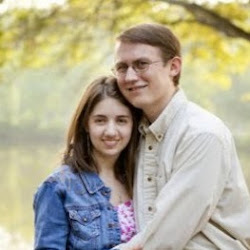 Do you follow Matt Kepnes' blog? Have you read his book? Do you think any travel book is worth owning? Share! I'd love to hear what you think!